Heading to Paris for a romantic honeymoon or family trip to the City of Lights’ Disneyland? Book a Paris holiday package and get the best airfares and hotel prices with only a few clicks. Don't waste time browsing through all the accommodation and airlines websites. Webjet curates specials with leading airlines and the top hotels in Paris to ensure you're getting excellent value for your money. All you need to do is enter your travel dates, choose a deal that matches your budget and - voila! You're on your way to one of the world's top destinations. Start searching the latest holiday package deals to Paris from Australia with Webjet's powerful search engine. You can easily fly to Paris from any of Australia's main cities. Sydney, Perth, Melbourne, Brisbane and Adelaide all have regular flights with a variety of airlines, including Qantas, Singapore Airlines, Emirates, Etihad and Virgin Australia. The cheapest route is usually between Sydney Airport (SYD) and Charles de Gaulle Airport (CDG). The fastest flight time between these two cities is 22 hours, but some airlines can take up to 50 hours depending on the stopover duration. Travellers departing from Australia can also fly into the smaller Paris Orly International Airport (ORY). Flights into ORY tends to have cheaper fares than those into CDG, and this airport is also closer the city centre, making taxis from the airport cheaper. Paris holiday packages boast some of the city's top hotels and apartments. Enjoy a honeymoon complete the finest things in life with luxury furnishings and room service at your beck and call in a five-star hotel, or make yourself at home with a fully-equipped kitchenette, lounge and a desk to get some work done. There is no shortage of five-star hotels in Paris. A trip here is the perfect excuse to indulge and pretend you're a member of the French aristocracy. Stay in a luxurious suite only minutes from Luxembourg Palace or keep things simple at one of the chic three or four-star hotels dotted around the city. A lavish hotel is often a go-to choice for those headed to the City of Lights on their honeymoon. Paris is home to an array of stylish apartments across the city. Whether you're looking to stay as close as possible to the Eiffel Tower, or you want something more secluded for a honeymoon, there's an option to suit your tastes. Whip up your own meals in the kitchen or enjoy a complimentary buffet breakfast downstairs. Staying in an apartment is an excellent option for small families or if you prefer having extra space during your stay. Your trip to Paris doesn't have to break the bank. Swap the decked-out hotel rooms for shared dorms and save big on accommodation. Prepare your meals in the communal kitchen, and make friends with other travellers exploring the City of Lights. Located on the banks of the Seine River, Paris is the romance capital of the world - a natural choice for a honeymoon. It's magical ambience, avant-garde art galleries, stylish cafes and cobblestone streets have captured the hearts of travellers for generations. However, the city isn't a destination for only couples and history lovers. Since opening Disneyland Paris, it's become an incredible destination for families as well. No trip to Paris is complete without a stop at the Eiffel Tower. It's one of the most famous monuments in the world and attracts hundreds of visitors each day. If you want a unique experience, book a table at the Michelin-starred restaurant located at the second floor of one of the tower’s legs. You'll have incredible views of the city as you feast on award-winning French cuisine. 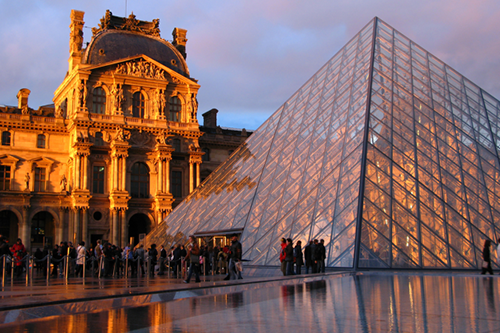 Once the home of France's monarchy, the Louvre is now a museum of fine art. Inside you'll find more than 30,000 works of art, relics from the medieval ages and European paintings from the 15th to 19th centuries. Due to the sheer size of the Louvre, it's not possible to see everything in one day. Instead, stick to a particular gallery like Italian Renaissance art or take a tour of the highlights. Head to the Boulevard Saint-Germain and take in Paris' cafe culture. Along the 6th arrondissement, you'll find some of the city's most prestigious cafes. The Cafe des Deux Magots is one of the most famous establishments on the street. It was once the haunt of literary greats James Joyce and Ernest Hemingway as well as the revered painter, Picasso. One of the best times to visit Paris is from late March to May. The city turns into a blanket of cherry blossoms, plus you'll also miss the summer crowds and find lower prices for Paris accommodation and flight packages. High season in Paris is during the European summer, from June to August. The weather is perfect for enjoying a bottle of wine in front of the Eiffel Tower. But if you want to avoid the increase in prices, book your Paris package well in advance. The cheapest time to visit Paris is during the winter months. From November to March, you'll find hardly any lines at the city's top attractions and excellent deals for tours or day trips are also available.